The finals of WWE 205 Live’s #1 Contender’s Tournament will take place on next week’s episode of 205 Live. Tony Nese and Cedric Alexander will meet in the ring to determine the number one contender for the Cruiserweight Championship. The winner will then face the current champion Buddy Murphy at WrestleMania 35 on 7 April. In the semifinals, Alexander defeated Oney Lorcan meanwhile Nese faced Drew Gulak and won. 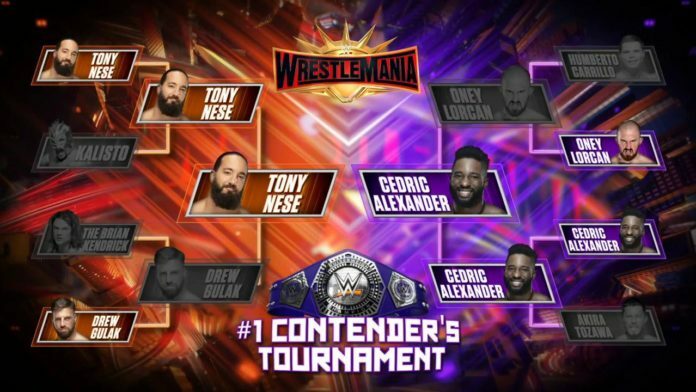 If Cedric Alexander wins the tournament he would a get a chance for having a second reign for the Cruiserweight title. Cedric first won the then-vacated title at WrestleMania 34 on April 8, 2018 by defeating Mustafa Ali in a tournament final. Buddy Murphy has been champion since October 6 when he won the title at the Super Show-Down event in Melbourne, Australia from Cedric Alexander. Murphy has held the title for 157 days at the time of this writing. Murphy has been appearing only in video promos on 205 Live and hasn’t made a ring appearance in a few weeks.